Avoid problems with the IRS!! set up a corporate records book, and more. 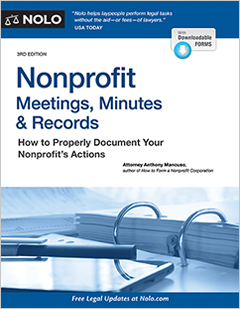 Nonprofit Meetings, Minutes & Records also provides useful tips and advice on how to do important tasks, such as organizing records, preparing meeting folders, and taking minutes—everything you need to create a paper trail and avoid trouble with the IRS. When Is Board Approval Required? When Is Membership Approval (or Ratification) Required? Let’s start by getting acquainted with certain key corporate documents, ones that you’ll refer to time and again through­out the life of your nonprofit. These include your articles of incorporation, bylaws, and other organizational documents. They contain your mission statement, the procedures you must follow to operate your nonprofit corporation, and rules to help you maintain your tax-exempt status. To operate effectively, you’ll need to keep your key corporate documents well organized and easily accessible. We’ll show you how to set up a corporate records book to help achieve this. Keeping good records is not merely a formality: It can provide crucial documentation in the event of an audit by the Internal Revenue Service (IRS), a lawsuit, or even a disagreement among directors, members, or anyone else about actions taken by your nonprofit. Many nonprofits start out as small grassroots organizations, spurred on by the volunteer and part-time energy of just a few people working out of someone’s house or office. Under state law, this type of loosely structured arrangement is considered a nonprofit association. It has the advantage of requiring minimal paperwork and it can obtain tax-exempt status using the standard IRS Form 1023 that nonprofit corporations use. However, every member of the nonprofit is personally liable for the claims, debts, and taxes of the organization. So, as a group increases in size and the scope of its work, it often decides to incorporate to protect its founders and members from personal liability for the group’s activities. There are other advantages to incorporating but this is often the main reason groups choose to do it. Getting familiar with your corporate documents is a bit like reading the directions for a new appliance—tedious but essential. For a nonprofit, you’ll find that these documents contain many important rules about how you must operate your nonprofit—everything from how to notify people about meetings to the minimum number of directors you must have. We’ll start with the big three: your articles of incorporation, bylaws, and organizational minutes. Then we’ll move on to others like your membership roster and consent forms. The primary corporate document for every nonprofit corporation is its articles of incorporation.A corporation comes into existence on the date its articles of incorporation are filed with the state corporate filing office. While most states use the term “articles of incorporation,” some states refer to this document as the corporation’s charter or certificate of incorporation, or by some other name. Articles of incorporation contain basic structural information, such as the name of the corporation, its registered agent and registered office address, and the corporation’s membership structure, if any. Nonprofit corporations also often include essential tax exemption information in their articles, such as their tax-exempt purpose(s), a clause dedicating their assets to another 501(c)(3) nonprofit organization or class of organizations, and other operating restrictions necessary for the nonprofit to obtain tax-exempt status (such as limitations on political lobbying and prohibitions against self-inurement). These provisions often mirror state and federal tax law requirements for nonprofit corporations and are a useful reminder for the nonprofit about the legal restrictions with which it must comply. They also provide the IRS with the assurance it needs to grant tax-exempt status to the corporation. Some nonprofit corporations include program or other descriptive information in their articles, such as an expanded mission or outreach statement. This information isn’t required in the articles and many nonprofits choose to put it in their bylaws instead because it’s easier to change bylaws than articles. If someone helped you incorporate (such as a lawyer, tax adviser, or paralegal), you may have received copies of these documents in a corporate records book or as part of a “corporate kit,” which includes a corporate seal (optional under state law) and a fancy corporate records binder. Some lawyers keep their clients’ corporate records, assuming they will handle the organization’s ongoing corporate work. If that was the case for you, you will need to request a copy of all the corporate documents in your client file. This is your property, so you have a right to receive it. If you can’t locate a copy of your articles of incorporation, write or email your state’s corporate filing office (often the corporations division of the secretary of state’s office) and request a certified or file-stamped copy. You may be able to order a copy online. Appendix B gives information on how to locate your state’s corporate filing office online. The office usually charges a small fee for copying and sending this form to you. Where to get help preparing your articles of incorporation. If you haven’t yet prepared or filed your articles, there are books that can help you. If you want to incorporate in California, see How to Form a Nonprofit Corporation in California (Nolo). In other states, see How to Form a Nonprofit Corporation (Nolo). Also check your secretary of state’s website for sample or ready-to-use forms. You can find contact information for your state’s corporate filing office in Appendix B. The bylaws of a corporation are its second most important document. Bylaws basically serve as a corporation’s operating manual. Anytime someone has a question like, “What’s the maximum time one of our board members can serve?” they’d look to the bylaws for answers. Bylaws contain the rules and procedures for holding meetings (like call, notice, quorum, meeting, and voting requirements), electing directors, appointing officers, admitting members (for a membership corporation), and taking care of other essential corporate formalities. You don’t file bylaws with the secretary of state—they are an internal document. However, when you apply for tax-exempt status from the IRS, you must include a copy of your bylaws with your federal tax exemption application. Most state nonprofit statutes have provisions that cover basic corporate governance matters just like your bylaws. But don’t worry, you are free to deviate from state law and fashion your own governance rules—as long as the rules you put in your bylaws (or elsewhere) don’t conflict with or violate a mandatory state law provision. For example, say your state law requires that at least six people must attend directors’ meetings in order to achieve a quorum. (Quorum rules are typical provisions of state laws.) You could set your quorum at eight people, but you couldn’t set it at four people, or below the statutory minimum. Often, nonprofits simply restate the state law requirements in their bylaws. That way, they know that if they follow their bylaws, they are complying with state law. It is also more efficient to have all the important operating rules easily accessible in one document. In any case, if a nonprofit’s bylaws don’t address an issue covered by state law, the state rules usually kick in. Make sure your bylaws are up-to-date. Fortunately, major changes to corporate laws generally only happen every decade or two, when states modernize their corporate statutes. Nevertheless, it’s possible that bylaw provisions that were valid at the time you adopted them will later become out-of-date and invalid under new state law provisions. If you plan to take major corporate action (such as restructuring your board or issuing a new class of membership), check your state’s current nonprofit corporation act and make sure your bylaws meet the law. We provide information on how to find your state’s nonprofit corporation act in Appendix B (and see “Checking Other Laws,” below). Bylaws also usually recite important federal or state tax exemption requirements. Again, this ensures that if a nonprofit follows its bylaws, it is doing its best to maintain its tax-exempt status. This information is also necessary to assure the IRS and the state that a nonprofit is eligible for tax-exempt status. Nonprofit bylaws typically include other rules for governance not addressed by state or tax law, such as the composition and operation of advisory committees, the duties of officers, and the rights and responsibilities of informal, nonvoting participants in the organization. These are all useful pieces of organizational history, especially if and when key staff members leave. Some nonprofits choose to give a more detailed description of the group’s purpose and programs, expanding on the summary given in the articles. Make sure you have a copy of your most recent, up-to-date bylaws. If you don’t have bylaws yet or want to prepare new ones, there are books that can help you with this task. If your nonprofit corporation was formed in California, see How to Form a Nonprofit Corporation in California (Nolo). 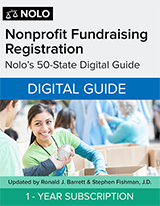 For help preparing state-specific bylaws for any other state, see How to Form a Nonprofit Corporation (Nolo). Your Personal Liability Protection Can Be Lost: Don’t Get Lazy! Limited liability. Corporate directors, officers, staff, and members usually are not personally liable for the debts or claims made against the corporation. This means that if the corporation cannot pay its debts or other financial obligations, creditors cannot seize or sell the personal assets of corporate directors, officers, employees, volunteers, or members. Tax exemption. A corporation is a separate taxable entity and can obtain tax-exempt status under federal and state law. If a nonprofit loses its tax exemption, it must pay corporate income tax on its net revenue (the corporate tax rate applies to nonexempt nonprofit associations too). Other benefits. Tax-exempt nonprofit corporations can qualify for grants, reduced mailing rates, real and personal property tax exemptions, and other benefits available only to recognized 501(c)(3) organizations. Perpetual existence. A corporation has an independent legal existence that continues despite changes in directors, manage­ment, or the nonprofit mission or program. Whenever you have a choice, put material in your bylaws instead of in your articles. Many states’ laws allow corporations to put their operating rules and procedures in their articles of incorporation or bylaws. If you have a choice, it’s usually better to put the material in your bylaws—they’re easier to change than articles. The voting requirements to amend bylaws are generally less stringent and you most likely don’t need to file anything with the state. Amending articles often requires a higher vote and you must file a formal amendment with your state’s corporate filing office. The first order of business for most newly formed nonprofit corporations is to hold a meeting to approve standard items of business necessary for starting operations. It’s usually referred to as the organizational meeting of the corporation. The meeting can be held by either the board of directors or the incorporators—whoever signed and filed the articles on behalf of the corporation (sometimes a lawyer or paralegal). tax elections—for example, setting your accounting period and tax year. Nonprofits often choose a calendar tax year and accounting period, which ends on December 31.
approval of other beginning transactions of the corporation, such as the opening of a corporate bank account, approval of leases, hiring or staffing resolutions, and the like. The meeting minutes also may include reports and recommendations presented by organizational committees and initial staff members. You should keep copies of these reports and records of any discussion attached to the organizational minutes in your corporate records book. Having a record of this information may be essential for your group to make informed decisions later. Lost your first minutes already? Some nonprofit corporations—especially those created in a rush—don’t have minutes of the first meeting of the board of directors or incorporators. It’s not the end of the world; you can proceed without them or recreate them. But be sure to note in your recreated minutes that they were created after the fact to memorialize actions taken by your initial board or incorporators at their first meeting. If your nonprofit is a formal membership organization, you will need to keep a roster of members, with each member’s name, address, and contact information (phone number, email, and physical address). (Not sure whether you’re a membership organization? See “What Is a Membership Nonprofit?” below.) It’s a good idea to record other relevant information for each member, such as the date a member joins or leaves the membership, dues paid, volunteer hours served, and so on. The membership roster helps track members and their activities, and verify their participation in the group’s program. If you have a membership nonprofit and haven’t set up a member­ship roster, do so right away. There is a Membership Roster form included with this book. You can fill the roster in and update as needed. Keep a hard-copy record of your current roster in your corporate records binder. What Is a Membership Nonprofit? No matter how many enthusiastic supporters your nonprofit has, you may not be, technically speaking, a “membership nonprofit.” In fact, you might not want to be. In most states, a “member” has a special definition under the law, and includes people who are given the right to vote for directors in the corporation’s articles or bylaws. The law may give members additional rights, such as the right to vote on structural changes to the nonprofit, transfers or sales of corporate assets, and whether to dissolve the nonprofit. In most states, a member also has the right to contest being expelled from the nonprofit, plus certain due process rights in the event of a termination. Nonprofits can establish a membership structure for their organization in their articles or bylaws. If your organization doesn’t, the directors fill vacancies on the board and approve corporate action. Most small nonprofits choose not to establish a formal membership because it’s simpler to have only the directors involved in managing the organization. And just to be clear, this formal membership structure shouldn’t be confused with the informal type of membership that nonprofits often create for their supporters, patrons, contributors, and advisors. These informal members have no rights under state law to participate in a nonprofit’s affairs. Whenever we talk about members in this book, we are referring to the formal type of member and membership structure. Whether your nonprofit is just starting up or you’ve been in existence for awhile, think “paper trail.” You should keep minutes of all regular meetings of your board or members, as well as minutes of special meetings and records of actions taken by written consent. These minutes and written consents are an important record of corpo­rate decisions and actions (great protection against faulty memories), and can provide crucial evidence that your group acted respon­sibly and with proper authority if disputes arise later. No matter how congenial your meetings are, you could come up against tough or probing questions from members, directors, contributors, creditors, the IRS, or anyone else. And as time passes, even people involved in the decision making may forget why, for example, you agreed to close down a certain program or who was involved in firing the executive director. No organization is immune from controversy and dissension. Written minutes and resolutions that record important decisions and the votes taken to approve them can help defuse potential blowups within the organization and avoid problems with outsiders. You should keep all these records in your corporate records book with your other key corporate documents. Your nonprofit may already have amassed a pile of other records, including contracts, tax exemption applications and related corres­pon­dence, leases, promissory notes, and other legal forms or paperwork. Make copies of these documents and keep them in your corporate records book. If someone handled the work for you, such as a volunteer lawyer or tax adviser on your board, ask the person to give you copies of any records. written consents to any actions taken by the board or members. Keep your corporate records book at the principal office of your corporation so you always know where to find it. As we mentioned earlier, you’ll refer to these documents time and again. You’ll use them on an ongoing basis to check rules and procedures for running your organization—what constitutes a quorum; who can call a meeting; what is proper notice; and so on. Keeping your documents well organized and accessible will help you operate more effectively. When procedural or corporate governance questions come up, you’ll be able to check quickly, answer with confidence, and move on. That way, you can stay focused on the more interesting and important program-related work you do. Having your documents in order can also help in the event your group is ever involved in an IRS or financial audit or a dispute among directors, members, creditors, contributors, or anyone else. In addition to the rules and procedures contained in your articles and bylaws, each state has a good-sized pile of laws that govern the organization and operation of local nonprofits. Some of these rules will be restated in your bylaws, but there will undoubtedly be times when you’ll need to look up the actual law yourself. Although you may not be champing at the bit to read a corporate statute, it’s not as hard as sounds. And, more importantly, most small nonprofits can’t afford to pay a lawyer upwards of $300 per hour every time they have a legal question or need help handling a legal matter, particularly something related to ongoing corporate formalities and straightforward procedures. We’ll teach you basic skills so that you can learn to answer some questions yourself, without having to seek, and pay handsomely for, outside legal assistance. We also encourage you to find a lawyer who is willing to provide some backup services as a legal coach rather than a full-fledged legal representative (see Chapter 8). State nonprofit laws are often designated as the Nonprofit Corporation Act or by some similar name. The easiest way to find them is to look online (see Appendix B). If you want to look up the law the old fashioned way (in a book), the county law libraries in most states are open to the public. Don’t hesitate to ask for assistance—research librarians are usually available. The nonprofit corporate statutes of many states contain the same, or quite similar, rules for organizing and operating business corporations. One reason for this uniformity is that a number of states have adopted some, most, or all of the provisions of a standard law called the Revised Model Nonprofit Corporation Act. Approximately half of the states have adopted selected provisions from the Act. You can browse the Act online. Once you have found your state nonprofit law, it’s often quite simple to find answers to questions you have. You can browse through the table of contents at the beginning of the act or look for a mini table of contents at the beginning of each section heading. Each heading should cover a major area of corporate operation or procedure, such as formation, meetings, directors, members, officers, or records and reports. Major headings are further broken down into subheadings that deal with specific matters within that section, such as articles of incorporation and bylaws, or director meetings and membership meetings. If you are searching online, you can also usually search for the subject you’re interested in by entering a few key terms, such as directors’ meeting or notice. State Tax or Revenue Code. If a state imposes a corporate income or franchise tax, the state’s tax or revenue code will typically contain these provisions as well as the rules that apply to obtaining an exemption from state corporate or franchise taxes. Commercial Code. The state’s commercial code contains the rules for entering into and enforcing commercial contracts, promissory notes, and other standard commercial documents. Civil Code. The state’s civil code may contain the state’s rules related to the regulation of charitable solicitations in your state. In some states, these rules may be part of another law, such as the state nonprofit corporation law or a separate state charitable solicitations law. Other state and local laws. State licensing and professional codes apply to special types of nonprofits, such as the professional licensing and practice statutes that apply to a nonprofit hospital and the state education code that applies to a nonprofit school. Various state and local laws may impact the activities and operations of all organizations, whether or not they are incorporated, such as state and local building codes. Even after you’ve created your nonprofit, most states require nonprofits to file periodic reports or statements with the secretary of state or the department of state. There is often a corporations division or corpo­rations department within that office that handles the filings. We provide information to help you locate your state’s filing office in Appendix B. Throughout this book, we refer to the office that accepts corpo­rate filings as the secretary of state or state filing office, even though in some states this office goes by a different name. Most secretary of state websites allow you to download corporate statutory forms (articles of incorporation, change of registered agent or registered office address, and so on). Many of these state websites also contain links to your state’s corporate tax office and state employment, real property tax, licensing, and other agencies. Check your state’s tax office website. The state tax office is one of the first places you should look to make sure you understand and are in compliance with your state’s tax exemption rules and annual filing requirements. In most states with a state corporate income tax, once you obtain your federal tax exemption, you also qualify for a state income tax exemption for your nonprofit. But even when this is true, you will need to comply with your state’s annual tax-exempt nonprofit information tax return requirements. See Appendix B to locate your state’s tax office online. Holding corporate meetings and preparing standard resolutions and other bits of paperwork are usually routine tasks for corporations. However, if the decision you are facing is complex, you anticipate any complications or objections, or you simply have questions and need more information, consult with a tax or legal specialist before using the forms in this book. A consultation of this sort will be far more cost-effective than making the wrong decision and having to fix it later. For information on choosing or using a legal or tax adviser, see Chapter 8.